While the ‘traditional’ sounds of Spain these days are generally unemployed youngsters queuing up for their next dole check, some slots developers prefer to remember the better times. Slot developer NextGen Gaming are no strangers to authentic portrayals of countries – as anyone who played their Asian-themed slot, Emperor’s Garden will attest – and Spanish Eyes sees a game packed with Flamenco guitars and castanets. A 5 reel, 25 pay-line slot, the reels in Spanish Eyes are rammed to the gills with roses, fans, classically styled 9-through-Ace symbols, together with the aforementioned guitars and castanets. And with betting starting at $0.01 a coin, it’s a game that won’t bust the Spanish economy (much). Look out for the sultry Flamenco-flinging girl, as she acts as the game’s Wild. She substitutes for all regular symbols other than the Scatter. There’s a healthy bonus for hitting five Wilds, but if you’re lucky enough to land Wilds on reels 1 and 5 simultaneously (no easy feat) you’ll trigger a straightforward Pick ‘em Bonus round. 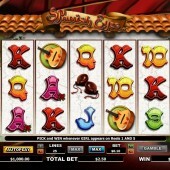 Here you’ll get to choose a Spanish dancer to reveal a bonus multiplier on your wins of up to 100x. Three or more Flower Scatters anywhere on the reels, meanwhile, wins you 12 free spins with a straight 3x multiplier attached. The spins can be re-triggered, so it could really add up to be a big bonus round. 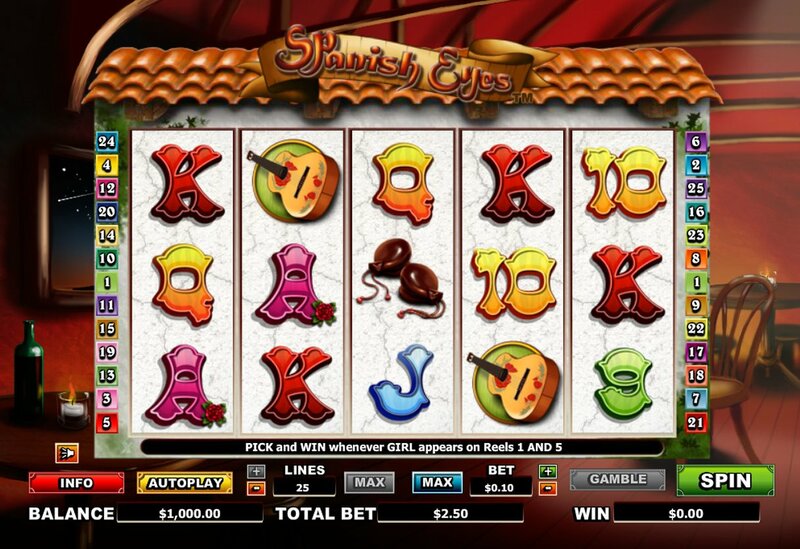 Spanish Eyes is a nice, good-looking slot for those on a bit of a Viva Espana tip, and while the Wilds are hard to hit, the 12 free spins should keep jaded slots fans interested. If you enjoy this, make sure you hunt out Leander’s dance-inspired slot, Lucky Tango, or Betsoft Gaming’s cracking club-themed slot, At the Copa, with its myriad of bonus rounds: both slots will put you in the Latin mood in no time.